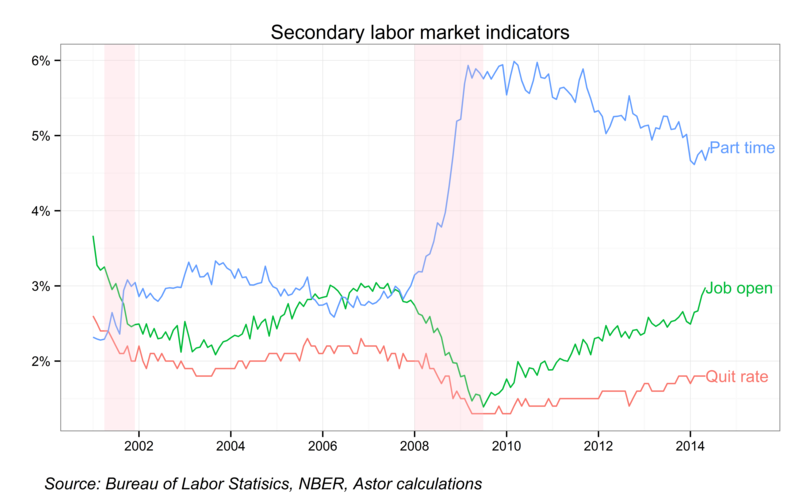 From time to time we also like to highlight some secondary labor market indicators to gain a deeper insight into the economy. The chart below shows both labor market improvement as well as continuing slack. The red line shows the quit rate, the percentage of the labor force quitting each month. It is at its post-recession highs but still well below where it was in the last recession, telling us that employees are becoming somewhat more confident about finding another job but there is still concerns about the demand for labor. The green line is job openings as a percentage of the labor force, which is about as high as it was before the last recession. Logic suggests that these openings will be filled in the future. Finally, the blue line shows the percentage of the labor force which is working part time, involuntarily (people who would take a full time job if they could find one). While much improved, this measure shows substantial slack left in the labor force beyond the unemployment rate. About 2.9 million part time workers would need to be made full time for the rate to return to the 3% level we saw from 20002 to 2007.